PRESENTATION – Master in Landscape Architecture Barcelona – Universitat Politècnica de Catalunya – 35ª EDITION. The master’s programme: Master in Landscape Architecture Barcelona is focused on project questions, and management and maintenance of the landscape while maintaining a commitment to current issues. It also places an emphasis on the need to continue investigating the big issues in landscape architecture while at the same time backing the exploration of emerging ideas. 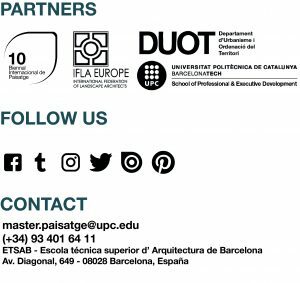 The master’s programme Màster Arquitectura del Paisatge was founded in 1982-83, and it was the first masters at the Universitat Politècnica de Catalunya (UPC) and the next course will be its 35th anniversary. Throughout this period over 578 professionals have taken this course which covers a very particular niche in the training for professionals in landscape architecture. At the end of the course the students will have to prepare a final project which will include spending a period of time in a landscape architect’s office and also doing their thesis.